You cannot shake the feeling that this is less a weapon than a doorway. The legendary Fireteam Tuyet died within the Ishtar Sink on Venus searching for secrets that the Vex kept closely guarded. And something they found quite valuable as the Vex descended upon Fireteam Tuyet with their usual and efficient violence. 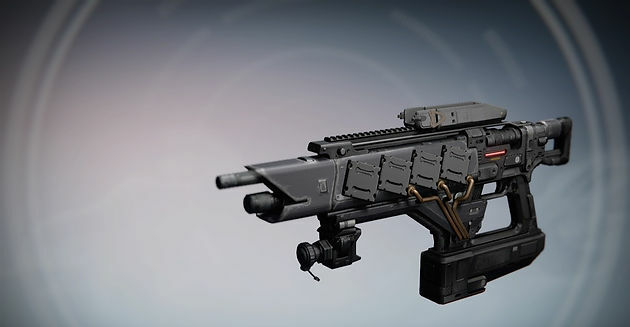 What Fireteam Tuyet was searching for will not be known but data recordings extracted from their mission allowed for the forging of the Pocket Infinity, With it being continually modified it should be possible for this weapon to put out an immense amount of damage on just a single charge. Could it have links to the mysterious Vex network? No one knows, so use it carefully. Pocket Infinity really lives up to its name with its small size and unique perk that allows it to fire forever. This exotic fusion rifle holds the exotic perk, Pocket Infinity which allows this weapon to fire in full auto mode and any charges that miss have a chance to be returned to the magazine. That last perk is particularly useful due to the Pocket Infinity’s high recoil although not every charge will be returned so keep that in mind. The main appeal of Pocket Infinity is the full auto firing ability which removes the problem of a fusion rifle not being able to fire quick enough to combat your enemies. On one single charge, you will be able to shoot a minimum of 6 charges (assuming your magazine is full) within a rapid space of time. However the recoil for this weapon is quite high so you will have to battle to keep it on target. For this reason it is definitely more of a PVE weapon due to it being able to clear out groups of enemies with relative ease. Just charge once and within all the flashes of yellow, attempt to keep it on target and you will be pleasantly surprised. In a PVP setting, this weapon might be considered a waste of an exotic slot, as the exotic perk will most likely cause to lose precious special ammo into the air that you might need to score some more kills. So with this weapon, it would be best to stick to PVE. The Pocket Infinity definitely has that look of being technologically advanced even in an age of firearm revolutions with which many exotic weapons of many different types are being brought to light. This fusion rifle has a lovely black colour scheme that is quite badass and on top of the weapon is an adjustable sight. However underneath the muzzle of the gun, there appears to be a laser sight perhaps to help keep this almost uncontrollable weapon on track. The main focal point of this weapon would have to be the four squarish shapes that are attached to the side of the weapon. They are linked to some form of metal wire which leads down close to the magazine. Perhaps, these structures are part of the technology which allows for multiple charges to be charged at once and then fired simultaneously. This weapon being left behind in year 1 is not available through conventional methods. In order to gain the Thorn, you will have to wait until Xur arrives, holding a secondary LEGACY engram and hope that you get lucky enough to acquire it.